Discover all the different versions of our lights. All versions operate off internal 12VDC batteries, LiFePo technology, rechargeable, fitted with a protection circuit or directly on 100-230VAC (except the underwater QMS6/12 P version). All lights work from all cases. 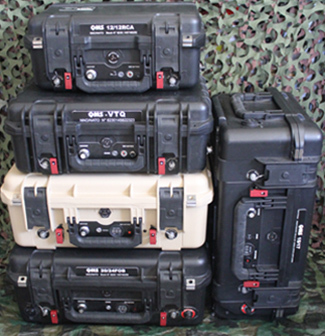 Custom cases and lights can be manufactured upon request. Each land or underwater light is studied, designed and developed with the various armed forces according to their requirements. The equipment is designed and manufactured entirely in France with components originating from the EC and Switzerland. Standards – DE2004/108/EC re. CEM2006/95/EC, all tests are carried out at our laboratories in France. ► Discover all the features and benefits of our products.